We are excited to announce that we have been awarded funding from The Greggs Foundation to create a sensory, community growing garden at Interplay Theatre. The picture above (taken by Andrew Procter) features Harriet, our Head of Creative Engagement here at Interplay with Peter Clegg, a garden advisor, Chair of cheltenham Green Doors and trustee of Vision 21 and SevernWye Energy Agency. After a recent visit, Peter helped us to create a plan of action and design for the garden and how best to spend the £2,000 grant from Greggs. It will feature some raised community growing beds, fruit trees, a living dome, animal habitats and feeders, an accessible path and disability friendly tools. We want to bring the West Leeds community together to engage with nature in a shared garden, where people can contribute skills, time and effort and take away produce, new friends and experiences. We also want to create a space where people with and without disabilities can work together. We will be starting work on the Garden this summer and with help from the local community groups and members of the public, we will be opening the garden within the next year. 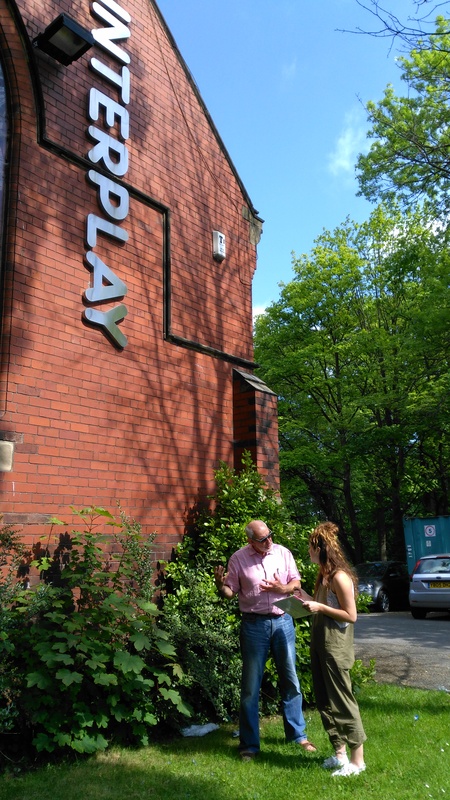 The Sensory Garden at Interplay is outside Interplay Theatre Trust on Armley Ridge Road and will be open 24 hours a day to the public.